Home › Archives › New Products! This week we have a couple more new products added to the store. First up: the USBtinyISP AVR Programmer kit – this is a great soldering project that, when completed, leaves you with a very useful programming tool. The programmer is compatible with almost all Arduino and “Minimal Arduino” with less than 64K flash memory and works great with avrdude. 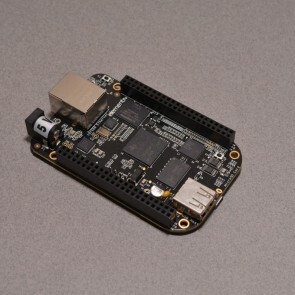 Next up we have the BeagleBone Black Rev C 4GB. This is a very powerful 1GHz single board computer with a ton of I/O, HDMI, DDR3 memory, and 4GB built in flash memory. The BeagleBone ships with a pre-installed version of Debian Linux but can be flashed to use many other flavors of Linux. Expect to see quite a few accessories for this in the near future!